How much of our behavior is determined by our genes and how much by our environment? Fiercely debated but not fully resolved, the nature-vs.-nurture question is something with which we continue to grapple. But research on the developing, adult and even aging brain is providing us with new ways of thinking about this issue – ways that, finally, promise answers. Whether the development of our brain, our personality, our intelligence, and behavior – and ultimately the demise of brain function as we age – are more likely to be shaped and affected by our environment or our genetic coding is key to understanding who we are. How we raise and educate our children, how we treat various mental diseases or conditions, how we care for our elderly – these are just some of the issues that can be informed by a better and more complete understanding of brain mechanisms. 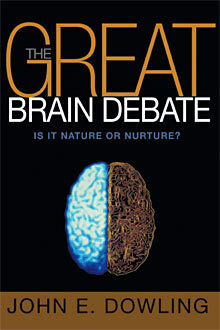 In The Great Brain Debate (National Academies Press, 2004), John Dowling, neuroscience researcher, looks at these and other important issues. Professor Dowling’s work, which focuses on the connection between the brain and vision, as well as the ways in which our brains help us learn new languages, is particularly revealing. Thanks to his and his fellow neuroscientists’ findings, we are now able to gain startling new insights into how the brain functions and how it can (or cannot) be molded and changed. By studying the brain across the spectrum of our lives, from infancy through adulthood and into old age, we see how the brain develops, transforms, and adjusts through the years. Looking specifically at early development and then at the opportunities for additional learning and development as we grow older, we learn more about the ways in which both nature and nurture play key roles over the course of a human lifetime. John Dowling is a Harvard College Professor and the Llura and Gordon Gund Professor of Neuroscience. I have been teaching neuroscience to undergraduates for more than 30 years – first mainly to biologists, now to students in the Mind, Brain, Behavior program which includes not only biologists, but psychologists, computer scientists, historians of science, philosophers, linguists and anthropologists. Enormous strides have been made in the field over the past five decades and neuroscience is now often called upon to shed light on many things from how we raise and educate our children, to the relations of genes and behavior, to cures for psychiatric and neurodegenerative diseases. This concise book was written to lay out a number of the neurobiological facts we presently have about the developing, adult and aging brain. What can and cannot be said from a neurobiological perspective about issues such as the nature-nurture debate, the role of genes in behavior, and whether maximal life span can be substantially increased in humans. The book provides ways, hopefully, to think about the issues, models that may not turn out to be right, but suggest we can eventually get at the answers. Directions of research are suggested, including how study of animal brains may give insights as to how the human brain works. It is not written for the neuroscience expert, but for those interested in the issues and for my students who so often ask me questions and my views on the topics covered in the book.